Now I’m sure by now, most businesses within Australia would have heard about the NBN, which stands for (National Broadband Network). All businesses and private dwellings will have NBN connected, which is dramatically going to impact businesses in a good way. However, businesses should be aware of the potential limitations too. The NBN Rollout plan is an initiative from the Government, and though there seems to be some good and bad hype around it, the biggest and most obvious impact will be the potential increase in your internet speed which will be a benefit to businesses. The existing telecommunications infrastructure of copper lines is outdated, and the NBN is here to replace this legacy framework to improve telecommunications and internet services throughout Australia. Fibre cables are installed to replace the old infrastructure, or the existing copper wire is being reused where suitable for the NBN. As of June 2017, the NBN rollout which according to a Choice survey is estimated only to hit the halfway mark. When the NBN is ready in your area, you’ll receive a letter to advise you that NBN is available and to make the switch. There will be a switch by date – don’t ignore this as if you don’t switch over your existing phone and internet services will no longer work. NBN is not an option; you must switch, therefore to mitigate any risk make sure you know what is required to run your communications and technology. Of course, we would expect the NBN to deliver faster speeds; this may not always be the case. In fact, in July 2017 it was reported that the ACCC was prepared to lodge action against telecommunications companies that sell high-speed National Broadband Network packages that they fail to deliver. It’s important for businesses to make informed decisions about the potential speed limitations, so they are aware of the implications to their business communication. Cloud services are becoming ever more popular for many business owners. In the areas that the NBN is delivering faster speeds, it makes the cloud-based systems an attractive option for businesses. If your company uses Terminal or Citrix servers to network multiple business locations, this infrastructure will no longer be necessary when using NBN. Which means significant cost savings for business by cutting out these types of servers and their associated support costs will save you money. When managing teams remotely across the state or country and even overseas, a cloud-hosted, PBX phone system can ensure your client/s can reach who they need. Your customers will appreciate the consistency and so will your team. There will be much better voice quality for you and your staff when using a hosted PBX phone system; you will notice the difference with fast NBN speeds. A godsend for many businesses that use the phone regularly for their business. The traditional copper lines will be disabled within 18 months of the installation of the NBN fibre-optic cable in an area. The NBN rollout plan is designed to reach 3.5 million homes and businesses over the next three years. The NBN may not be in your area yet, but it is coming – is your business prepared? One thing we like to make sure is our clients do not wait until the last minute to change over to NBN. We hear this often from many business owners, ‘everything is working great, and we don’t want to change.’ As mentioned before, there is no option; you will have to change within the 18-month period. The most common areas that will affect businesses are the following. Do not leave it to the last minute, ensure you know exactly what is required to make your business NBN ready and to avoid the costly mistakes many businesses are making by not being prepared. At Prosum we can help you with these changes and provide a quick and reliable service for you and your business. Contact for advice today. We provide communication and technology solutions to businesses of all sizes, across all industries, right around Australia. With 50 years of expertise, no one knows technology and communication like Prosum. From Hosted PABX and VoIP solutions to cloud-based phone systems, NEC Phone System Support and SIP Lines, we provide expert advice on the communication products and services that will suit your organisations’ needs. 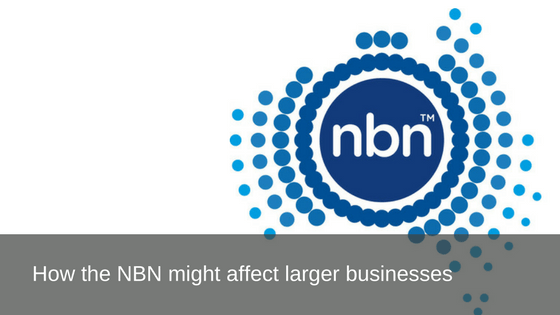 If you would like to discuss how your corporation can improve communications, or to discuss how the NBN may impact your organisation call us today for expert advice – call 1800 007 229 or visit www.prosum.com.au we’d love to hear from you. We are locally based and do not utilise overseas support staff.